Prices include postage and are as follows in the table below. Please contact us at deep6rec@aol.com for pricing and postage on wholesale orders. Overseas orders can be cheaper if you order more than one item at a time. Email deep6rec@aol.com to receive a multiple item shipping price. Be sure to include the items you want in your email. You can also find Deep Six Records releases through distributors such as Independent Label Distribution, Ebullition Records, Raunch Records, RSR and Hate Ape Productions, Revelation Records, Blitz Records, and more! Please go to the Distro page for a full list. We use PayPal for all credit card purchases. Send payment to deep6rec@aol.com after following the important steps as shown below. 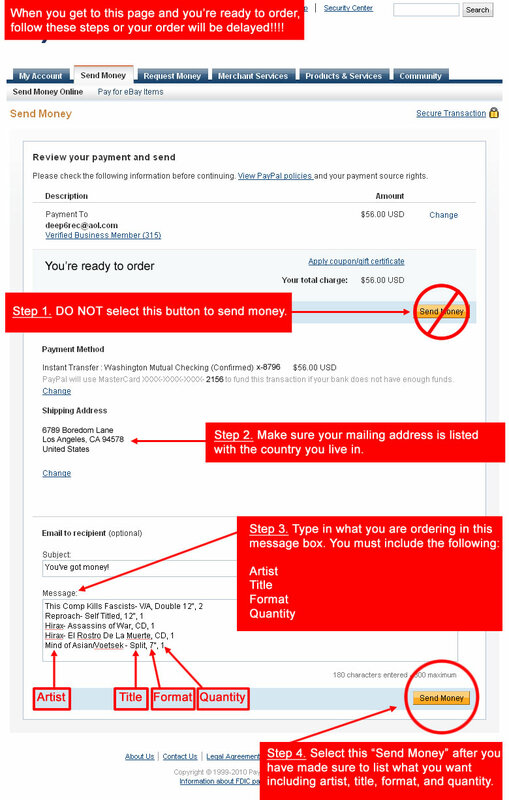 Below is a screenshot of an order made on PayPal. Follow the steps as shown below or you will risk your order being severely delayed. This is extremely important!!! 1. Write your name and address legibly (that means it's easy to read!) along with your order. 2. If you decide to send cash, hide it well! We can't be held responsible for greedy mailpersons. 3. For non-U.S. orders, please send payment via International Money Order. Pay in U.S. currency only. Some Deep Six releases contain naughty words and controversial ideas, so don't blame us if Mom & Dad get mad.